be sure to check out the SAQA regional blogs from time to time. Up here in the Great White North, there are three regions (!) for our vast land mass: Western Canada (B.C., Alberta, Saskatchewan and Manitoba), Central Canada (Ontario and Quebec) and Atlantic Canada (New Brunswick, Prince Edward Island, Nova Scotia and Newfoundland). 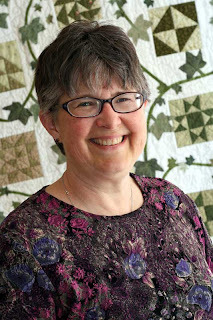 I love that happy smile - and the quilt is beautiful. I love the new photo of you! You have a beautiful smile!